Snack food industry; United States. 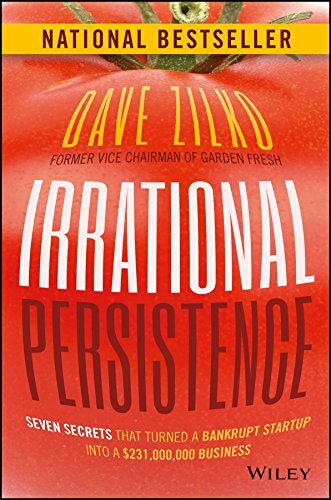 Irrational Persistence tells the story of Garden Fresh Gourmet, and how two entrepreneurs turned a million-dollar debt to a 100-million-dollar annual revenue. Woody Allen famously said that 80 percent of success is just showing up; but any entrepreneur can tell you that it's the other 20 percent that's key. The founders of Garden Fresh took that old saying to heart, building so many strategic advantages into their products and business that their 'sales' team didn't have to do any sellingâthey simply had to show up. In this book, you'll find out what kind of legwork goes into building a mega-success product, and the strategies, methods, and just plain stubbornness that helped two guys from Detroit build a market leader. Garden Fresh Gourmet is now the number-one fresh salsa in the US, shipping over a million units every week to Costco, Walmart, Whole Foods, and other national chainsâand it all began with two middle-aged guys with negative funds and plenty of ideas. This book shares their journey, insight, and passion to help you build a better business and take it to the top. Garden Fresh Gourmet is an inspiration beyond the journeyâthe way you run things at the top matters, too. Irrational Persistence shows you how to make the tough decisions, live with the sacrifices, and prioritize your values as you build your brand and just keep on going. About: A modern-day Detroit success story that fuels the entrepreneurial fire Irrational Persistence tells the story of Garden Fresh Gourmet, and how two entrepreneurs turned a million-dollar debt to a 100-million-dollar annual revenue.